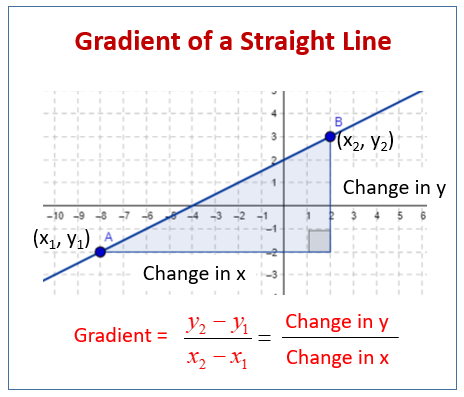 Examples, solutions, and videos to help GCSE Maths students learn how to calculate the gradient of a straight line graph. The following diagrams show how to find the gradient of a straight line graphs. Scroll down the page for more examples and solutions on finding the gradients of straight line graphs. 1. work out the gradient of a line given two points on the line. 2. select two points on a given line to work out the gradient. 3. use the gradient of a line and a known point on the line to work out the co-ordinates of a different point on the line.